Solo Whist is a trick taking style of card game that was introduced to the United Kingdom in the mid-19th Century by a Dutch-Jewish community. The game derives from a Spanish game known in the United Kingdom as Ombre, but until its introduction into the United Kingdom, Solo Whist was confined primarily to Jewish communities. Solo Whist falls into the category of trick taking card games where there is a revolving trump suit determined at the beginning of the hand. Like many games of this sort, a hand of Solo Whist consists of two phases: the bidding phase and playing phase. One unique feature of Solo Whist is that partnerships can develop and dissolve from hand to hand, and a player will often find herself or himself pitted against the other three players. Solo Whist uses a standard 52 card deck without jokers. All play, including the deal, proceeds to the left (clockwise). The game is designed for four players. Initially the first dealer is chosen at random. One way to do so is to have each player draw a card and the player with the highest card ends up being the first dealer. After shuffling the deck, the dealer will hand the cards to the player on his or her right, who cuts the deck towards the dealer. The dealer then places the original bottom half of the deck on top of the first and deals out all the cards in the deck until each player has thirteen cards. The most common way of distributing the cards is for the dealer to deal out three cards at a time to each player until there are only four cards remaining in the deck. The dealer deals out the last card to each player and turns the last card face up. Whatever suit this card is determines the trump suit. Once everyone notes the trump suit, the dealer returns the face up card to her or his hand. Bidding in Solo Whist works differently than a lot of other trick taking games. After the dealer has indicated the trump, the first player on the dealer’s left consults his or her hand and decides whether to bid or pass. In the event that all players pass, they can discard their hands and the deal will rotate clockwise to the next dealer, with this hand being declared a misdeal. The Prop (1): a player will propose the capability of taking 8 total tricks in combination with another partner who has yet to be determined. The Cop (1): This is an acceptance of another player’s prop. If you look at your hand and see a good number of trump suits after someone has made a Prop, you may reply with the Cop, which means you and the first person to make the prop will act as partners with the other two players opposing you. Solo (1): A solo bid means a player can take five tricks by himself or herself, and the three remaining players will attempt to stop the player with the solo bid. Misère (2): A player bidding misère will lose every trick with there being no declared trump suit. Abundance (3): If a player has a number of cards of a particular suit, which was not the suit the dealer exposed, this player may want to bid abundance, which is an attempt to win 9 tricks alone, but the player can wait to name the trump suit until just before that player’s first turn. Abundance in Trumps (3): This is the same as the abundance bid, except the player making this bid will use the suit exposed by the dealer as the trump suit. Misère Ouverte (4): When bidding this version of misère, the player will attempt to lose every trick and there are no trumps. 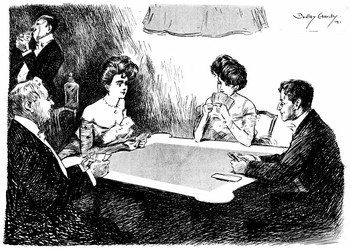 The primary difference between misère and misère ouverte, is that in the latter, after the first trick has been played, the declarer of misère ouverte will place her or his hand face up on the table so all the players can see. Abundance Declared (6): Bidding abundance declared means you must take all 13 tricks by yourself and there are no trump suits. However, when bidding this, you do get to play first. Each bid in the list ranks higher than the previous bid listed. Therefore a player cannot bid misère if the previous player bid abundance, for example. Once a player passes, that player may not bid again except when this is the player to the dealer’s left and another player has bid prop. The player to the dealer’s left may bid cop or pass. If a prop bid is not responded to with a bid of cop, the original bidder has the option of changing to a bid of solo or passing, in which case it is a misdeal. Unless the contract is abundance declared, the player to the left of the dealer leads out first. Players must follow suit if they have that suit or they can play from any other suit including the trump suit. The highest card in the suit that was led wins unless a trump is played, in which case the highest trump card wins. The ranking order of cards in this game follows the standard beginning at the top with Ace, King, Queen, Jack, and 10-2. After each hand, the points are totaled. In some versions, these points can be considered multipliers for agreed upon wagers. For example if everyone agrees that each point is equal to $1, then if two players bid and make the eight tricks (or more) for a prop and cop bid, the other two players owe $1 each which goes to the winning players. However if the two fail to reach eight tricks in their prop and cop bid, they will in turn pay their opponents $1 each. If one player bids and makes solo, as another example, each of the other players must pay the winning player $1 apiece (assuming the agreed upon stakes are $1 per point) for a total of $3, but if the one player has bid and made abundance, then each player owes the winning player $3 apiece for a total of $9. Solo Whist has no built-in ending. Instead it ends when the players agree to stop playing.